The Very Rev. Mike Kinman prepares for an interview Tuesday with 'St. Louis on the Air' host Don Marsh at St. Louis Public Radio. 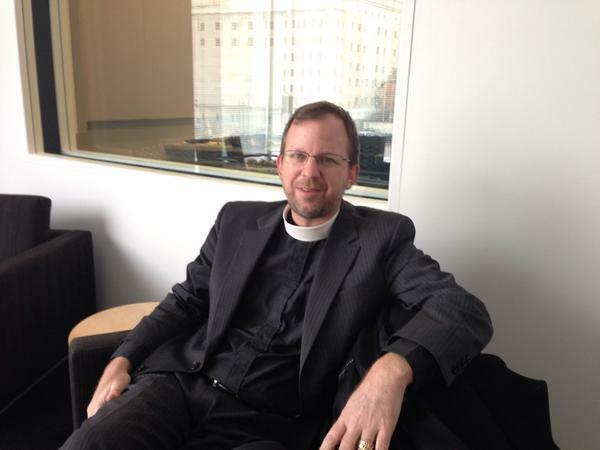 "St. Louis on the Air": Mike Kinman discusses faith and Ferguson. In August, Michael Brown was shot and killed by police Officer Darren Wilson in Ferguson. Protests began almost immediately. Many believe race played a role in the shooting. Brown was black; Wilson is white. Kinman said nonviolent protests are raising awareness of issues that have long affected the St. Louis area, including race, class and poverty, and are causing discomfort, which he said is the point. “We have to show people like me who didn’t think that Mike Brown’s death and everything that is being exposed by this has anything to do with them, that this does, that this is all about us,” he said. To help take that conversation farther, Kinman has asked clergy from St. Louis and across the country to address race and class with their congregations. Many have been willing to do that, he said. After the grand jury’s decision to not indict police Wilson was announced last week, protests spread across the nation. After the shooting and decision not to indict the officer responsible for it, Kinman said many people have lost faith in the system. Changing that will take time, he said. “We’re in a state of negative trust,” he said. “This is highlighted by the relationship between the demonstrators and the police, but it exists in many other places to the point where it’s not just if you say something, I’m not sure if I believe you. It’s almost to the point where if you say something, I believe the opposite is true. Building trust and relationships will take more than conversations with friends and neighbors, Kinman said.